Team Canada plot a game plan. Alvin Bagaya. CRICKET. 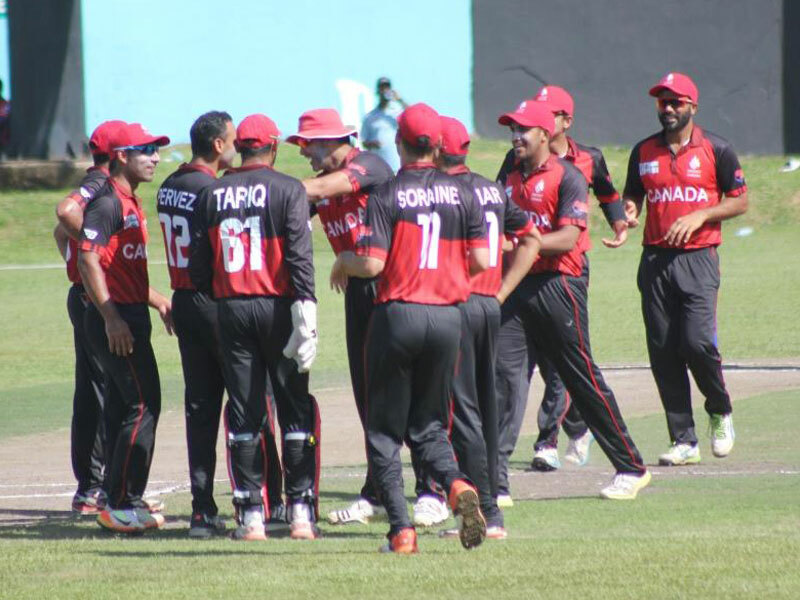 Canada is arguably the most formidable side in the 2017 ICC World Cricket League Division III tournament. One would be forgiven for thinking they were a Division II side venturing in the lower ranks. They have all departments covered and it will take a phenomenal job to dislodge them from the top of the table because any opponent must come with a bowling attack worth their weight in wicket taking abilities. Nitish Kumar has looked irremovable in his opening display; the opener seems to have enough time for a Latte with two sugars between bowlers release and execution of his shots. Against Uganda he displayed the compact ability to play under the nose reminiscent of Justine Langer who forced bowlers to come to him. Kumar is a real threat for his ability to get behind the ball and run it down to third man or drop it in front of mid-wicket and keep rotating strike. His ability to treat the short ball with as much respect as he would a persistent mosquito is a joy to watch. After two innings, he is averaging 38, but scoring quickly at 95%, he does not waste deliveries, and he is a man who knows his percentages well. Denying Kumar is a real headache for most attacks in the tournament and anyone who may do that will have found the key. He was brilliantly run out against Uganda and stumped off a wide ball against Oman; before these points, Kumar looked like batting till the Division 2 begins. Bhavindu Adhihetty is the perfection of the left/right combination. After two innings, he is averaging 27.00 but going along at 124.4%, another quick scorer in the side, he never allows bowlers to settle into a rhythm as they constantly have to deal with him and Kumar forcing a variation in line, and, inevitably, errors that are punished with sublime placement. Bhavindu and Kumar have the highest score in opening partnership for the first wicket with a 77 against Oman at 4.56 an over, without any risk. The real problem for most teams, however, is the seventh and eighth wicket of Canada; Rizwan Cheema, who has now blasted 133 runs in two innings at a strike rate of 192. He has left many captains hovering like a kite in the midst of his hurricane. A batsman that is not afraid to lose his wicket and can smack his fourth ball of the innings over the sight screen for six is not what most captains want to deal with at no.7. Against Oman, the seventh wicket put on 23 at 9.85 (Cheema/Dutta) and the eighth wicket put on 72 at 8.64 (Dutta/Tariq). Most bowlers will struggle to deal with this kind of hitting power and most captains will have no answers to field placement. Against Uganda, the first wicket put on 32 at 6.62 (Kumar/Adhihetty), second wicket 42 at 4.27 (Dhaliwal/Kumar); and they still showed that they can grind it out when in trouble in the middle order after they were shaken by a quick collapse putting on 30 at 2.27 (Pathirana/Dutta) for the sixth wicket. Canada has the luxury of having the industrious Dhanuka Pathirana. There are few in Division III who may rotate strike like he does, almost like he decides where the bowler must place the ball, his wrist stroke-play supplemented with good range on the boundary clearing shots. Against Uganda, Pathirana laid the foundation for rebuilding a faltering innings and was the launchpad upon which Cheema destroyed the bowling. Cheema and Tariq have shown the consistency of decimating bowling attacks after a good middle order showing from their side. As it stands, by the time most bowling attacks get past Adhihetty, Kumar, Dhaliwal, Dutta, Pathirana and the seemingly out of form Hansra, they are more or less vulnerable to the cataclysmic presence of Cheema and Tariq. Tariq proved his ability in the Oman game; he was planting Munis Ansari who has one of the better yorkers over the stadium wall at the death, to imagine Canada has him at number eight. Cecil Pervez (15) and Satsimranjit Dhindsa (12.1) have sent down 27.1 overs picking 5 wickets a piece with a wicket every two overs, the real value being shown when Zeshaan Maqsood had begun to bat Oman into the game and Dhindsa switched ends to pick his wicket from the Jinja road end, a strike bowler a captain can turn to break partnerships and pick key wickets. On the back of the most dangerous opening bowling pair in the tournament, a young opening partner who bats with the technical awareness of a seasoned campaigner, a brilliant middle order led by the workman like Pathirana, a steady batter like Dhaliwal at one drop and the pernicious tail end of Cheema and Tariq, with Hansra and Dutta to hold fort in the middle ; Kumar has the peace of mind to build innings at the top and lead his side without too much fuss or destructions. It is only a matter of time before we see his classy hundred, in this division or the next.